The number of countries experiencing annual house price growth is on the rise even as the average rate of growth moderates. 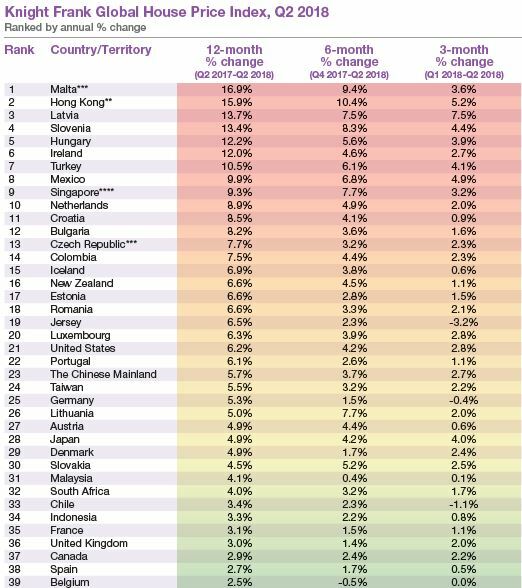 The Mediterranean island of Malta has moved ahead of Hong Kong this quarter to take the lead in our Global House Price rankings. According to data from the Central Bank of Malta prices increased 17% year-on-year. Supply constraints, combined with a robust economy (6.6% GDP growth in 2017) and a buoyant technology industry is pushing up demand. 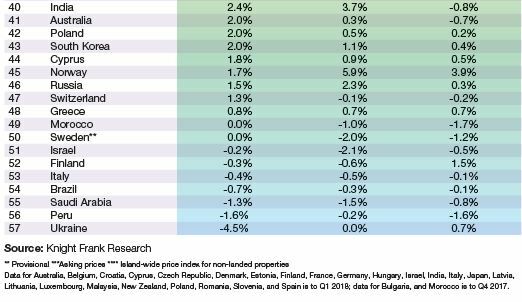 Only seven countries and territories (12% of those monitored) registered a decline in prices in annual terms and no market has recorded a double-digit decline in house prices over the last six quarters. Five years ago, 30% of countries were recording a drop in house prices, and ten years ago, in the wake of the financial crisis, the figure was as high as 70%. Yet despite this improving scenario, at 4.7% the index has recorded its slowest rate of annual growth since Q3 2016. Our analysis confirms that whilst fewer countries and territories are seeing a decline in house prices, where prices are rising, they are rising at a more moderate pace. The rising cost of finance, an uncertain political and economic climate and currency instability in some markets is likely to be tempering demand. Hong Kong acts a case in point. A city which has led our rankings for price growth on ten occasions since 2009, is expected to cool in the coming months as a result of rising interest rates. Along with Singapore and New Zealand, Hong Kong has also seen new property market regulations introduced in the last three months (Figure 3). Central and Eastern Europe is emerging as a region of strong growth. Latvia, Slovenia and Hungary all saw prices accelerate by between 12% and 14% over the year to June 2018 and the region as a whole registered average growth of 8% compared with 5.1% for the rest of Europe (Figure 4). Strengthening economies, improving employment and the wider availability of low rate mortgages are behind the region’s strong performance. Turkey’s travails mean that although prices are rising at an annual rate of 11%, according to the latest data from the Central Bank of the Republic of Turkey, when inflation of 16%+ is factored in, prices in real terms are now falling. With the 10-year anniversary of the collapse of Lehman Brothers approaching on 15 September, a brief look at house prices over this period (where data permits) shows mainstream house prices in 12 of the 57 countries are still below their Q3 2008 level, including those in Spain, Ireland, Italy, Greece and Russia. The Knight Frank Global House Price Index established in 2006 allows investors and developers to monitor and compare the performance of mainstream residential markets around the world. The index is compiled on a quarterly basis using official government statistics or central bank data where available. The index’s overall performance is weighted by GDP on a Purchasing Power Parity basis and the latest quarter’s data is provisional pending the release of all the territories’ results.